Performance Series*. New & Improved*. Advanced Muscle Mass Gainer*. Designed For The Hardgainer*. Build Mass & Strength*. Multi-Phase Protein System. Formulated With Omega-Rich Fats. 80g Protein. 1170 Calories. 7g Leucine. 13g BCAAs. 10g Creatine. 7lbs New Size More Servings. If you’re serious about performance and results, you need the All New MuscleTech Performance Series! No Proprietary Blends*. No Fillers*. No Underdosed Key Ingredients*. No Hype. No Banned Substances (WADA)*. No Exceptions. Just the Most Powerful Formulas Available*. Mass-Tech – More Protein, Better-Quality Calories, Bigger Results! 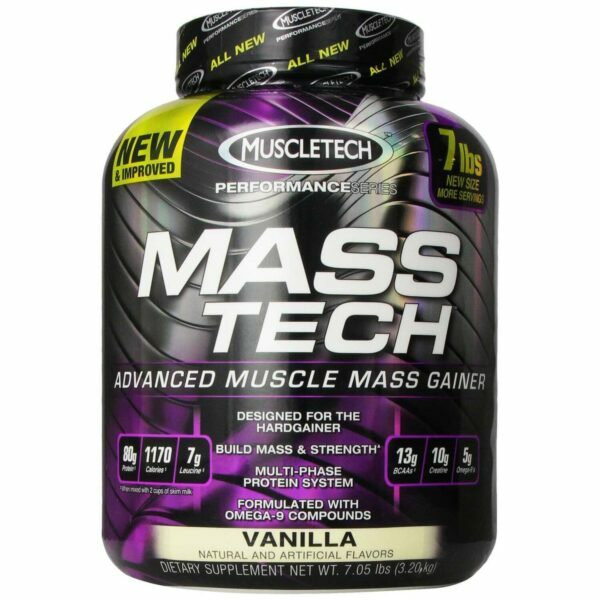 * New Mass-Tech is an advanced muscle mass gainer designed for any individual that has a tough time adding size, is in their bulking phase and/or wants to break through their strength plateaus. Power-packed with 80 grams of protein and 1170 mass-producing calories when mixed with 2 cups of skim milk, this potently superior formula is enhanced with proven anabolic drivers for rapid mass gain and strength! * Better-Quality Calories Designed for the Hardgainer*. 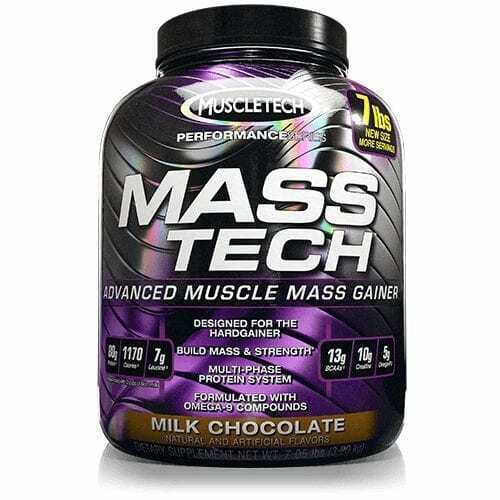 Mass-Tech is the most versatile weight gainer available*, which can be taken once daily or split into two separate half servings. The new, powerful formula now delivers a massive 1170 calories derived from high-quality protein and quickly digested carbohydrates, as well as specialized fats*. More Protein per Serving Than Other Weight Gainers*. New and improved formula features an 80 gram multi-phase protein system, when mixed with 2 cups of skim milk, that supplies fast, medium and slow-digesting proteins. 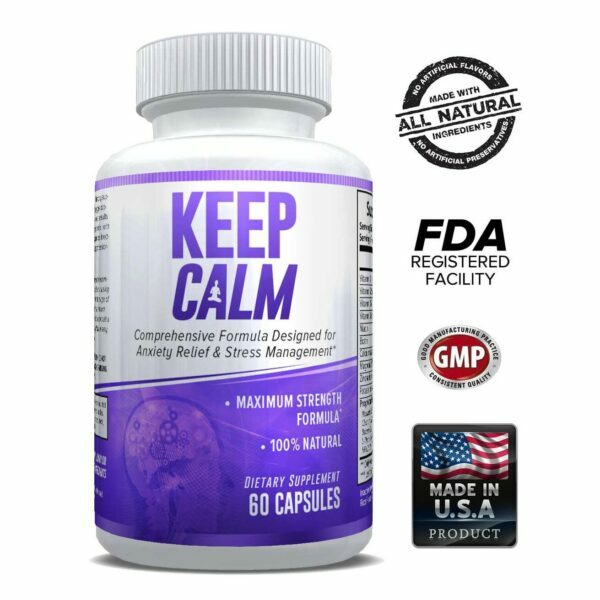 The multi-phase protein system provides critical amino acids to the body at varying speeds for extended delivery of amino acids in the blood*. More BCAAs and L-Leucine per Serving Than Other Weight Gainers*.The formula’s protein dose when mixed with 2 cups of skim milk supplies a massive 7 grams of L-leucine and 13 grams of BCAAs, which help fuel your skeletal muscles*, preserve muscle glycogen* stores and help to reduce the amount of protein breakdown*. Added Amino Acids for Enhanced Effects*. Beyond the key ingredients it supplies, Mass-Tech also provides additional ingredients, such as a 3-gram dose of L-alanine. 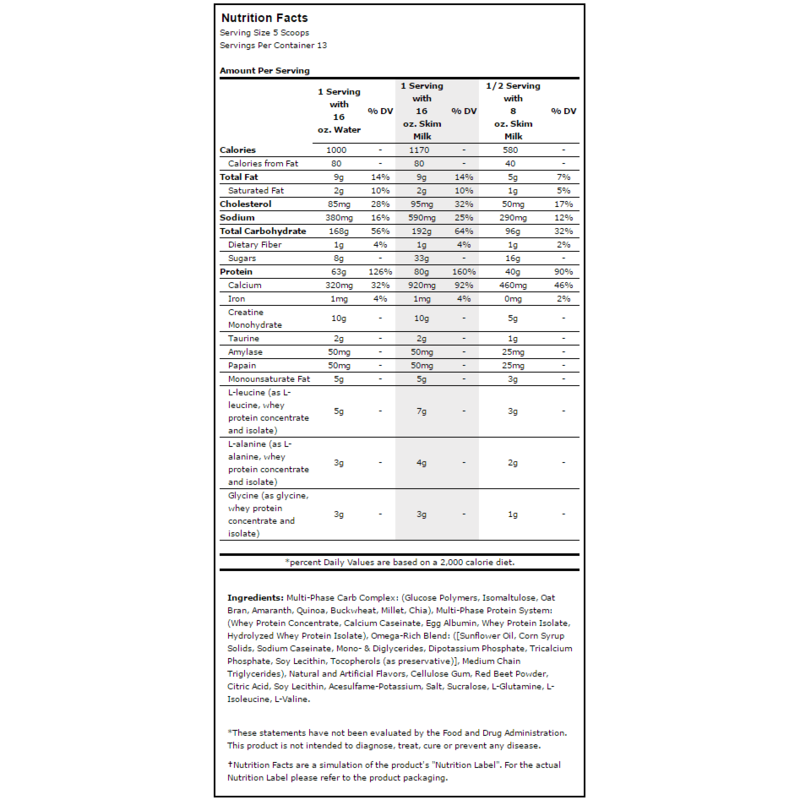 L-alanine is the second-most used amino acid after L-leucine in protein synthesis. It has even been noted to play a role in glucose production for useable energy*. 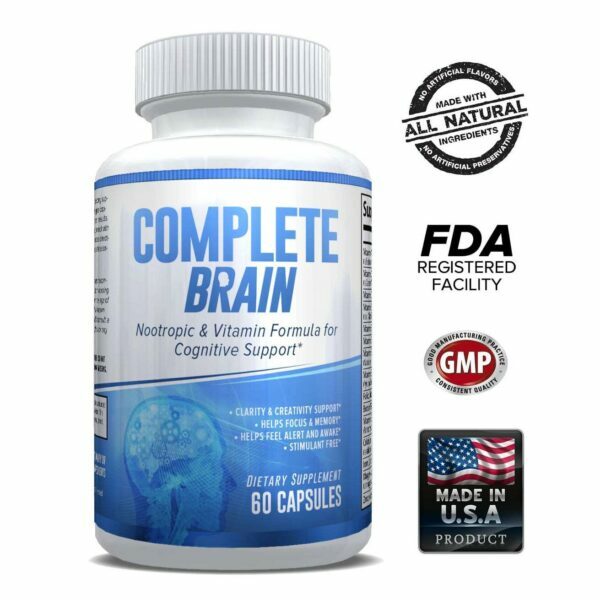 The formula also delivers a 3-gram dose of Glycine, an amino acid that may help in the formation of many other biological compounds in the body, such as proteins and creatine. * Taurine was also included as it’s the second-most abundant amino acid found in muscle, after glutamine, and aids c ell volumization*. Build Strength Faster*. 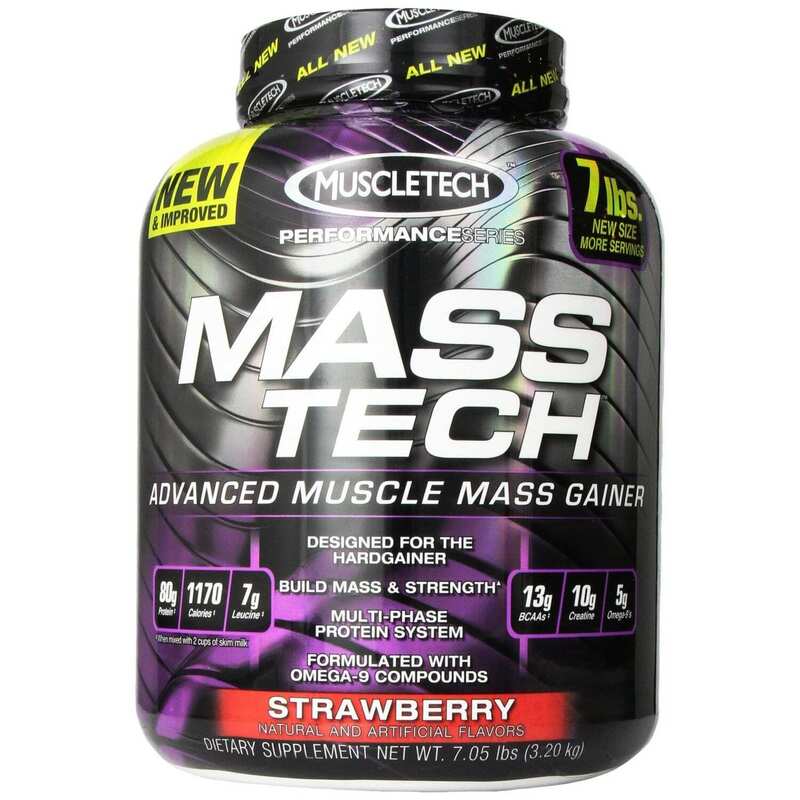 Unlike other leading gainers that contain little to no creatine*, Mass-Tech delivers a 10-gram clinically validated dose to increase strength fast*. Help Replenish Glycogen Stores*. Supplies 168 grams of carbohydrates through a multi-phase carb complex to both spike insulin, quickly shuttling creatine into the muscle, and promote muscle glycogen replenishment, helping to put the body into an anabolic state*. Formulated with Omega-Rich Fats*. The full-spectrum formula contains less saturated fat than other weight gainers* and is formulated with 5 grams of omega-rich fats, which provides energy-dense calories*. Get More for Your Money. Unlike the competition, Performance Series products contain superior key ingredients in clinically dosed amounts that are fully disclosed so you know exactly what you are paying for. Best-In-Class Taste*. Every flavor won in head-to-head third-party taste tests against the leading competitors. Directions Mix 1 serving (5 scoops) with 16 oz. of water or skim milk and consume either in the morning, between meals or post-workout. If preferred, you can consume ½ serving twice daily. Read the entire label before use and follow directions provided. Warnings Contains Milk, Egg, Wheat and Soy Ingredients. Processed in a facility that also processes peanut ingredients. Do not use if pregnant or nursing. Consult a medical doctor before starting any diet or exercise program. Do not use if packaging has been tampered with.